turnitin.com/en_us/what-we-offer/revision-assistant/■Retail Price: Ranges from $7 -$10 per student per year, based on volume purchased. Introductory pricing is available through 12/31/16. Product Description: Revision Assistant is an online writing tool that provides writing prompts and feedback for students in grades 6 through university at the click of a button. It is not a spelling and grammar check; rather, it uses sophisticated algorithms to check student writing for adherence to the prompt as well as the assigned rubric and provides both positive and corrective feedback. The algorithms were trained using actual student writing scored by experts. Quality and Effectiveness: There are currently 38 prompts available for ELA and social studies topics, and many of them provide documents with which students can interact. Prompts are categorized for grades 6–8, 9–10, 11–12, and AP and college. AP course prompts include English and World History. Prompts are aligned to most state level standards and the Common Core. Revision Assistant helps students write expository, argumentative, and narrative essays. Students can use a pre-writing area to organize their thoughts in a genre-specific outline before starting to write. They then send their notes to the writing area and begin to draft the essay. As students write, they can “signal check” their work to receive feedback. 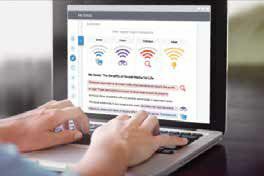 Revision Assistant’s wi-fi-like signal bars indicate how students are doing on each of the criteria, and the tool offers specific comments throughout the essay as well. Rubrics for each type of essay include four areas of focus, such as Clarity and Focus, Use of Evidence, Development of Ideas, and Language and Genre Awareness. Ease of Use: For teachers, creating a class and assigning a writing prompt is easy and intuitive. Students then enter the code given to them by the teacher. The interface is intuitive and clean, and easy-to-understand support materials are available in both video and text formats. Creative Use of Technology: Automated feedback on student writing is still in its infancy, and Revision Assistant is at the forefront. Revision Assistant doesn’t take grading out of the hands of the teacher, but students who wouldn’t normally involve the teacher in the drafting process can use Revision Assistant to see both strengths and areas to improve. The feedback is clear and accurate. While formative assessment has been shown to increase student engagement and achievement, it can be a challenge for teachers to find time to provide it for every student on every assignment. Revision Assistant helps alleviate some of the strain of trying to provide lots of students with appropriate and timely feedback. Suitability for Use in a School Environment: Because Revision Assistant provides the prompts and supporting texts when appropriate, teachers can quickly and easily incorporate this tool into their assignments focusing on specific standards. Teachers can monitor student writing and the feedback they receive to provide additional support where needed. They can also use the prompts to extend the discussion to the classroom. Revision Assistant also integrates with several LMSs, including Moodle, Schoology, Canvas, and Brightspace. Several lesson plans, written by pilot schools, are also available to help teachers integrate Revision Assistant in to the classroom. Revision Assistant is a fantastic tool to help students improve writing skills while answering engaging prompts and receiving formative feedback. It also helps teachers to see the student writing process in a way they may not have before. The ease with which Revision Assistant can be integrated into the classroom makes it a perfect tool for formative assessment. ● Ease of use—it’s quickly and easily integrated into the existing curriculum with a clean and clear user interface. ● Engagement—prompts are engaging and appropriate. ● Timeliness—formative assessment and immediate feedback help alleviate frustration for students and teachers.